So I’m studying an MA course in Sequential Design/Illustration at Brighton. Part of our Visual Narrative unit was to create and present a project that delivered a surprise in a sequence of six images or objects. 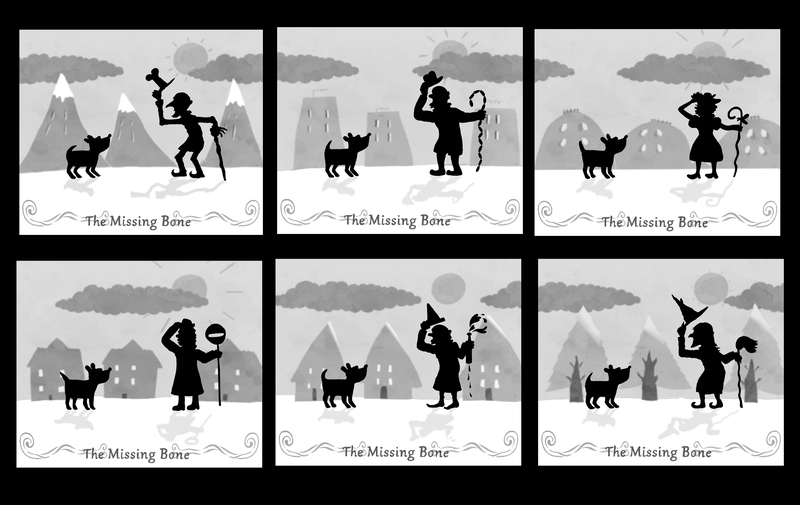 I looked to create a simple six image illustrated story (a dog asking a series of town-folk if they have seen his missing bone) that would then transform into a looping animation when skipping through the images quickly. A moving image sequence disguised as a series of still images. I used silhouettes to mask the transitions between one character and the next but also I liked the timeless, Lotte Reiniger feel that this created. I found it really interesting and challenging to find a balance between making each character different but finding similarities to thread together the animation. Also recently went to see Tales of the Night by Michel Ocelot as part of Eastbourne’s Film Society screenings. That too, seemed very Lotte Reiniger inspired, with silhouetted characters performing a series of light-hearted subversions of myths and fairy tales.